It appears that John has begun to doubt. He sends two of his disciples to Jesus to ask him if he is the promised Savior. It seems that John doesn’t know for sure that he is. Why else would he ask? On the other hand, consider who John sends. He sends his disciples. He doesn’t give a boy a quarter and ask him to deliver a letter to Jesus. He sends his students, those he was teaching. He sends them to Jesus. This is the sign of the good and faithful preacher. He sends those he is teaching to Jesus. A preacher who doesn’t send you to Jesus is no good. The last prophet God sent before John was Malachi, four hundred years earlier, whose book concludes with God’s promise to send John to prepare the people for Christ, the promised Savior. John’s entire ministry was to prepare the people for Christ. Are we to believe that when John was languishing in prison he began to doubt everything he had ever preached? He was the one who identified Jesus as the Lamb of God who takes away the sin of the world! He forgot this? I don’t believe it. John sent his disciples, his students, to Jesus. That’s what the text says and that’s what he did. The Bible doesn’t say that John doubted. It says that he sent his disciples to Jesus to ask Jesus if he were the coming one or should they look for another. John knew what Jesus would tell them. That’s why he sent them to Jesus. The faithful preacher sends his hearers to Jesus. John sent his disciples to Jesus. And how did Jesus answer their question? He didn’t say yes. Instead, he pointed them to things they could hear and see so that they would know the truth from the Bible. Jesus doesn’t ask you to search your heart for the truth. He doesn’t tell you to find a feeling inside that will validate your faith. My wife tells about the time – it was in the eighties when God was blessing us with many children – she met with some friendly Mormon missionaries who stopped by the house. One of them, a very sincere young lady, told Dort that if she read the Book of Mormon and prayed God would give her a feeling that it was true. Dort told her very bluntly that she couldn’t possibly trust her feelings. No, with always being either pregnant or nursing, her hormones were going crazy. She couldn’t trust her feelings. The Mormon missionary was speechless. And the tongue of the mute sing. Jesus pointed John’s disciples to how he had fulfilled biblical prophecy. Jesus points us to the Bible and the Bible points us to Jesus. My family moved from a small town in northern Minnesota to a suburb of St. Louis, Missouri in the summer of 1957, the summer I turned four. I grew up on the campus of Concordia Seminary in Clayton where my father was a professor of theology. During the sixties and seventies the Lutheran Church – Missouri Synod was wracked by a controversy about the Bible. The controversy was centered at the seminary where I lived. 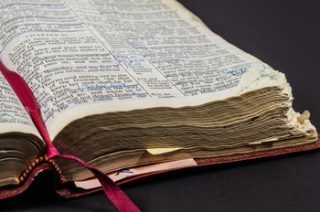 Some of the seminary professors taught that the Bible contained errors and contradictions in it; that it erred in matters of history, geography, science, and so forth, but that it didn’t matter. They claimed that many of the miracles recorded in the Bible were embellishments and not literal reporting of historical occurrences, but that didn’t matter, either. The purpose of the Bible, they said, was to show us Jesus, not to teach us about history, geography, and science, so it didn’t matter if the Bible erred on these matters. Those who argued that the Bible was inerrant because God was not capable of error were accused of worshipping the Bible instead of Jesus. The Bible-doubting professors accused their critics of putting their faith in the Bible instead of in Jesus. This pitting of the Bible against Jesus is popular among men who think that they can deny the historical accuracy of the Scriptures and still hold onto Jesus. That is both arrogant and naïve. It can’t be done. When folks start finding errors in the Bible, sooner or later Jesus is twisted into someone he isn’t. The last of the signs that Jesus mentioned to prove he was the Christ was that the poor had the gospel preached to them. It is the most important of the signs because it continues to the end of the world. God may not cure you of your disease, or restore the sight in your eyes, or enable you to hear with your ears. Nowhere does God promise us that he will do these things for us. But the preaching of the gospel to the poor is what Christ does through his preachers until the end of time. The poor need the gospel. They need the biblical gospel, the message of God sending his Son into the world to fulfill the law and suffer for our sins on the cross to set us free from our sin, from the fear of death, and from Satan’s power. They need the gospel that enriches the spiritually poor with the true knowledge of God. The gospel is good news. St. Paul put it quite succinctly: “This is a faithful saying and worthy of all acceptance: Christ Jesus came into this world to save sinners.” To know Jesus where he suffers and dies for us is to know true wealth. There are unbiblical gospels that twist the real Jesus into a counterfeit. This manufactured Jesus doesn’t come into this world to save sinners from their sins, but to advance a political philosophy, or a strategy for personal success, or a promise of health and wealth – anything else but rescue from our sins. There are many counterfeit Jesuses. The genuine Jesus, the biblical Jesus is the humble suffering Servant who bears the sin of the world on the cross and takes it away. He is the Lamb of God that John the Baptist said he was. He is a cause of offense. Jesus says, “Blessed is he who is not offended because of me.” Jesus left John in jail from which Herod took him and cut off his head. John, a faithful preacher, was murdered by a corrupt king. St. Stephen, a loyal follower of Jesus, was murdered by an angry crowd that he angered precisely because he preached the truth to them. They stoned the prophets and murdered the apostles. Martin Luther was made an outlaw for teaching the truth. Faithful preachers get shot down for no other reason than that they preached what God told them to preach. God has no use for reeds that blow with the wind, testing popular opinion so that they can know what to preach. And if a fellow wants to get rich and live in a mansion somewhere, he should at least go into a business that makes money, and not one that depends on the freewill giving of God’s people. John is held up by Jesus as a preacher par excellence. John cared more about what God said than he cared about what anybody thought of him. The world judges preachers, not by their faithfulness in preaching the truth of God’s Word, but by their winsomeness, their ability to inspire people to embrace a vision, their skills at all sorts of interpersonal gobbledygook that never saved a single sinner from his sins. Ministers who think that the ministry is a road to personal acclaim, success, popularity, and status aren’t ministers of Christ, but man-pleasing hirelings. They have their reward. St. Paul teaches us that the minister of Christ is to be a faithful steward or manager of God’s mysteries. John called a spade a spade. He paid for it with his life. He was a different sort of man, set apart, even from his mother’s womb, to be a bit different. After all, he ate locusts and wild honey! But a preacher can have no better model to follow than John. Why? He sent his disciples to Jesus. You need Jesus. You need him every day. Every time you come to church you come burdened by sins you have committed against God. You haven’t loved God with all your heart. You haven’t loved your neighbor as yourself. God’s commandments indict you, try you, and convict you. You cannot rid yourself of your own sin. Left to your own devises, your sins would poison your faith and destroy your soul. From cradle to grave you are poor and needy. You need Jesus. The preacher’s job is to send you to him. The obedience and suffering of Jesus as our substitute is not merely a theological doctrine to which we give assent with our lips. It is the gospel in which we poor sinners trust. Because we are poor. We haven’t done what we need to do to get what we need to have and we stand before God spiritually poor with empty pockets and guilty hearts. But Christ speaks his divine mysteries through his ministers showing us that when he obeyed it was our righteousness and when he suffered is was forgiveness of our sin. Jesus, the Savior, saves us whenever we hear the gospel, for it is the power of God unto salvation to everyone who believes. John died in prison, murdered by a vain braggart who killed him after making a fool of himself being captivated by the charms of a pretty girl. What injustice! Remember that injustice, oh preacher, whoever you are, because you deserve no better than John. Thank God for the privilege of preaching the gospel that enriches the poor with the eternal treasures of God’s kingdom.